Education levels are often cited as a key factor in explaining differences in opinion between voters, but as Mark Bovens and Anchrit Wille illustrate, many national parliaments have highly unrepresentative numbers of MPs with university degrees. They highlight that the number of MPs with degrees has increased substantially in western European countries over recent decades, and that the absence of low and medium educated citizens in parliaments and other political venues constitutes a serious democratic deficit. Many West-European countries are currently celebrating (or are about to celebrate) the centenary of universal suffrage for males. The Netherlands introduced universal suffrage for males in 1917, the UK and Belgium in 1918, and Germany in 1919 for both men and women. From this point on, the right to vote and to run for office no longer depended on wealth, social status, or educational qualifications. Any citizen could become a member of parliament, an alderman, or a minister, regardless of his or her education or professional status. There is little reason for festivities, however. In fact, contemporary political practices are diametrically opposed to this constitutional ideal. Parliaments in Western Europe are currently the domain of a select group of well-educated citizens. No less than 90 percent of the members of the Dutch Parliament, elected in March this year, have attended college or graduate school. Likewise, 87 percent of the members of the British House of Commons, elected in June, attended university and 10 percent have postgraduate qualifications. In the new German Bundestag, elected in September, the share of postgraduates is even higher: 130 out of 709 members have a PhD-degree or even a Habilitation. Very few MPs only have primary or secondary qualifications. Most of the mature Western European democracies have become diploma democracies – they are ruled by those with the highest formal qualifications. University graduates are overrepresented in all relevant political arenas, not only in Parliaments or cabinets, but also in political parties, organised interests, deliberative venues, and internet consultations. Aristocracy, rule by the nobility, and plutocracy, rule by the wealthy, have given way to meritocracy, rule by the well-educated. Almost 90 percent of the members of Parliament in Belgium, Denmark, France, Germany, the Netherlands, and the UK, are tertiary educated – the highest percentage since the introduction of universal suffrage at the beginning of the 20th century. Over the course of the past century, the low and medium educated have disappeared from parliament, from cabinets, and from many other political arenas, even though they still constitute a very large majority – up to 70% in most countries – in the electorate. The proportion of university graduates among members of Parliament shows a U-shape trend in most countries. It was very high during the second half of the nineteenth century, when suffrage was very limited. At the beginning of the 20th century, less educated social groups started entering the various parliaments due to the extension of suffrage and the rise of socialist, communist, and Christian-democratic parties. During the first half of the 20th century, the proportion of deputies with university degrees decreased substantially in most countries. 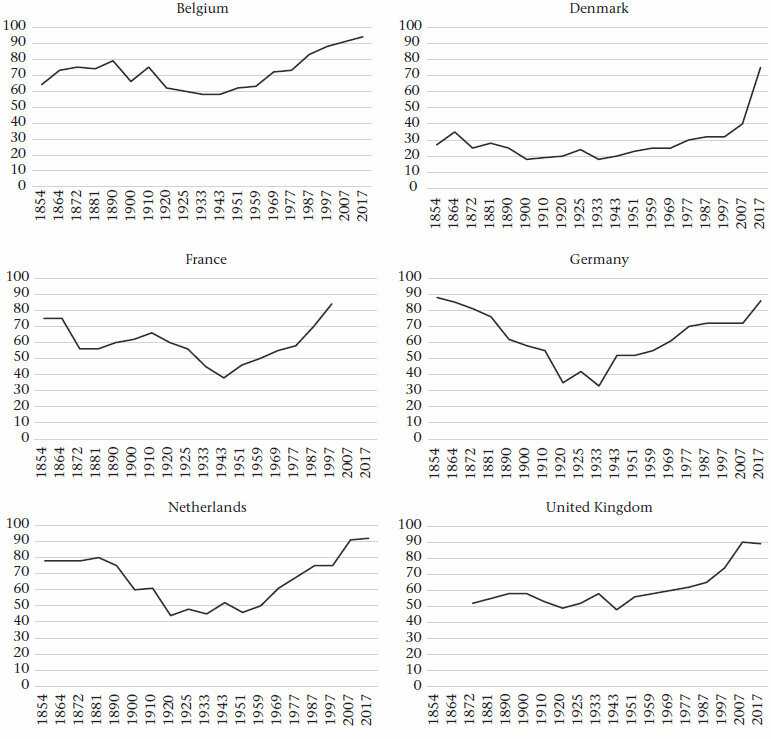 After WWII, the number of MPs with higher educational qualifications started to increase, first gradually and then sharply from the seventies onwards. For example, before WWII, the proportion of university graduates among Labour MPs in the UK was under 20 percent. After WWII, this percentage rose steadily, reaching an all-time high of 88 percent in 2017. Large educational gaps can also be observed in all other forms of political participation, such as voting, signing petitions, taking part in boycotts, deliberations and internet consultations, or in membership of civil society organisations. Education is not a politically neutral variable, however. The well-educated and the less well-educated live in different social worlds and do not mingle. University graduates watch public television and read ‘quality’ papers. They live in a university town, a green pre-war suburb, or in the 19th century gentrified parts of the inner cities, such as Prenslauer Berg in Berlin, De Pijp in Amsterdam, or Notting Hill in London. Those whose educational career ended after junior high school or primary vocational training, tend to watch commercial television and read tabloid papers. They live in former industrial areas and manufacturing towns, in the post-war satellite cities, such as Marzahn in Berlin, Lelystad in the Netherlands, or Slough in England, or in the 20th century outskirts of the major cities. Educational groups differ in health, in life expectancies, in wealth and income and have different interests and preferences on a number of salient political issues. Why, then, do we worry about gender or ethnic inequalities in political representation, but not about educational inequalities? To start with, the complete absence of the majority of low and medium educated citizens in many political venues constitutes a serious democratic deficit. There is an emerging literature that shows that the overrepresentation of university graduates in Parliament is simply not in line with the preferences of large parts of the electorate. A university background in political representatives is unattractive to many voters. Citizens generally want representatives who are “like them,” either in appearance, background, or experience. Most importantly, different levels of education may sometimes lead to diverging political attitudes and preferences. Well-educated citizens and activists are socially and politically confident. They express trust in the national and European political institutions and they feel included in the political process. They see immigration and EU unification, not as threats, but as opportunities. Less well-educated citizens, on the other hand, tend to be very sceptical about the EU, and worry about crime and immigration. They show high levels of social distrust and political cynicism. They feel they are not being listened to by politicians and that politics today ignores the opinions of the common person. Given the composition of present day political parties, parliaments and cabinets, these feelings of distrust and alienation should not come as a surprise. Because the higher educated are over-represented among political participants and politicians, the political agenda regarding some of the most salient issues of our time tends to be biased towards their priorities and preferences. Diploma democracy is a flawed form of democracy, as ultimately it excludes a sizeable proportion of the population from meaningful political participation. Citizens with low or medium educational qualification levels currently make up a large majority of the electorate, yet they are extremely underrepresented in parliaments and other political arenas. The situation is not that different from the late nineteenth century, when formal diplomas sometimes determined whether or not a citizen was entitled to vote. Almost a century after the introduction of universal suffrage, some advanced Western democracies are, practically speaking, back to where they started. Note: This article draws on the authors’ book, Diploma Democracy: The Rise of Political Meritocracy which was recently published by Oxford University Press. The article gives the views of the authors, not the position of EUROPP – European Politics and Policy or the London School of Economics. Mark Bovens is a Professor at the Utrecht University School of Governance. Anchrit Wille is an Associate Professor at the Faculty of Governance and Global Affairs of Leiden University. It’s good that you are writing about this. It has troubled me for some time that politicians in countries such as Poland seem to be more involved with actually writing vindictive legislation then they possibly should be, rather than being focussed on the needs of their electorate and making sure that civil servant legislators get it right. The situation makes for a bloated rule book and bad legislation while discouraging objectivity about rules they themselves have written. If only they had an effective civil service to advise and to blame. I’m not sure about prevalence of tertiary education amongst Polish politicians but higher education in Poland evidently does not guarantee rational logic or emancipation – rare birds in the ruling aviary. Erstwhile, highly qualified academics of the ruling party behave much like belligerent manual labourers. Constipation seems to be endemic, which maybe led to the present failed state. I apologise to manual labourers for any offence caused.